The University is situated at the backdrop of Maruthamalai Hills in the Western Ghat range, in a sprawling campus of 1000 acres of land. 15 kms. from the City of Coimbatore. As of now the University has 104 affiliated colleges, 92 Arts and Science Colleges, 2 University Colleges, 12 Management institutions and 1 Air Force Administration College. In addition, there are 25 Research Institutes of the State and Central Governments, which are recognized by this University for research purpose. And all these institutions cater to the educational needs of more than 1,50,000 students and research scholars. To be innovative, inclusive and international University; committed to excellence in teaching, research and knowledge transfer and to serve the social, cultural and economic needs of the nation. To innovate and offer educational programmes in various disciplines with synergistic interaction with the industry and society. To impart knowledge and skills to students equipping them to be ready to face the emerging challenges to the knowledge area. To provide equal opportunity to women students and prepare them to be equal partners in meeting the scientific and technological demands of the nation. To contribute to the advancement to knowledge through applied esearch leading to newer products and process. To prepare the students to work for societal transformation with commitment to justice and equality. To inculcate among students a global vision with skills of international competence. Our vision is to provide Internationally comparable quality higher education to the youth. The aim is not only focused on imparting subject knowledge and skills, but also to mould the students with better conduct and character committed to the societal needs and national development. Enshrined with the motto “Educate to Elevate”. 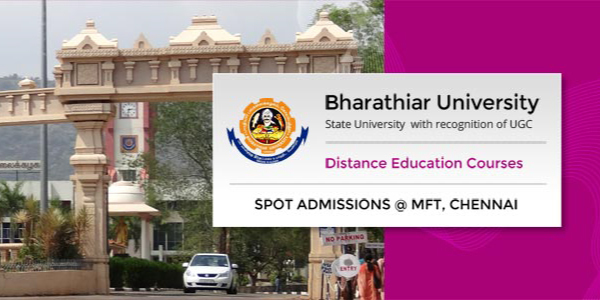 The School of Distance Education (SDE) of Bharathiar University was established during the academic year 1991-92. The school has limited its operation for the obvious reason of strengthening its base to provide quality education. Having realized the objective, the school has started extending its action by identifying and approving study centres throughout the country to help achieve higher gross enrolment ratio and higher literacy rate. The study materials prepared in the prescribed format of Distance Education Council (DEC) are provided to the students supplemented by compact discs for hassle free use anywhere at any time without the burden of carrying the course materials. Contemplated to provide video conference based learning facility.